The sun shines bright over Reims, as bright as the lounges of the town hall of Reims where the golden hues of the Champagnes spotlighted today are sparkling. Gleaming and brilliant robes, floral, mineral or fruity scents, all have come together to highlight the talent and know-how made in Champagne. Some fifty exhibitors attended this annual tasting which has become a must, in the presence of Paolo Basso, Best Sommelier of the World 2013, and Fabrice Sommier, Best Craftsman of France (MOF) and Master of Port. They were once again accompanied by the Associations of Sommeliers of Champagne-Ardenne, Hauts-de-France, Lorraine, Burgundy, and Paris but also by wine shop and restaurant owners and merchants. At the end of the day, Paolo Basso confirmed that it was “interesting to study the differences between the houses, the winemaking styles, the origin of the grapes or the different maturations. Everyone puts his character and personality into the wine”. An encouraging speech for the Champagnes present as they expected a professional advice about their wines. As for Fabrice Sommier, he reported the pleasure he had to be able to taste such a broad selection of Champagnes, both from major Champagne houses and young winemakers. An enthusiasm shared by Eric Arnaud, president of the Champagne-Ardenne Sommeliers Association, who highlights this year's trend: vintage Champagnes and Extra Brut cuvées. 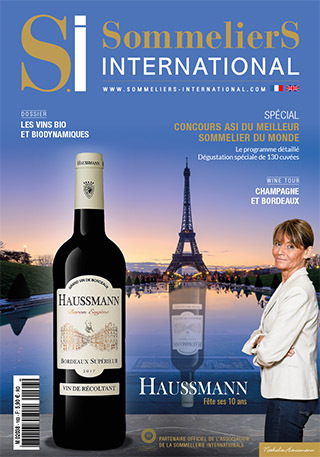 SommelierS International wishes to thank all those present and especially the students of the vocational hotel business school of Bazeilles for their precious help. Created in 1678, the Riedel luxury glasses have over time been imposed by demonstrating the importance of the size and shape of the glass in tasting. Today Riedel occupies an important place in the hotel industry by launching the ranges Riedel Restaurant and Restaurant Sommeliers. For our event, the professionals could use the Riedel Veritas Champagne crystal glasses that sublimate the tasting moment. Established in the south-west of France since 1270, the Frapin family is a family of winegrowers and distillers for 21 generations. They own a vineyard of 240 hectares in Grande Champagne. Exclusively harvested, distilled on the lees and aged at the domaine, the Cognac Frapin 1270, tasted at lunch, owes its name to the arrival of the Frapin family in the Segonzac area. A worthy heir to the know-how of the house, it has a great aromatic richness, enabling it to be used as an after-dinner drink or as an aperitif, especially for mixology. Its beautiful straw-yellow colour is evidence of the time spent in new Limousin oak barrels. In the nose a great aromatic richness with aromas of vine flower and linden and a melted touch of vanilla. On the palate, the Cognac has a beautiful roundness, richness and balance, a beautiful length and light aromas of vanilla or toast.